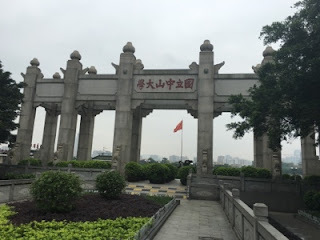 Our visits to Flower City and the Guangzhou Public library. This is post number 7 in the Ni hao (Hallo) China Travelogue. After our tea experience, we spent the rest of the day at Guangzhou's Flower City Square. It is now the largest square in Guangzhou. There are many attractions that surround Flower City Square. You can see the Opera house, the museum, the massive public library and the Canton Tower from the square. Because it was raining (again) and misty, we could not see the Canton Tower. Our tour guide, Mina, said " she was hiding because she was shy. The Guangzhou library is an architectural and cultural marvel. This public library was designed by an international team from Japan and China. The library resembles an open book, the designers' interpretation of their "Beautiful Books" idea. The design is is based on the Chinese character, "Z". When you view the library from a distance, you can see the open book design, which creates the sense of pages being turned. This fifth post in the Ni hao (Hallo) China Travelogueseries, covers our experiences of various aspects of Chinese culture. Enjoy the trip with us. The country's flag is red with five yellow stars. The big yellow star refers to the party of the country, the Community Party of China (CPC). 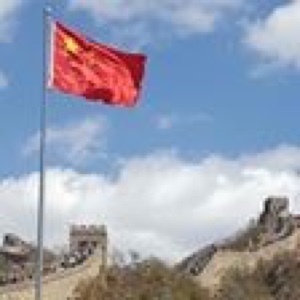 80 Million Chinese belong to the CPC. The four smaller stars represent the different groups in China. In the other post, I mentioned that there are 56 different groups in China, with the Han being the largest. China is shaped like a rooster on a map. The three main cities are Beijing, Shanghai and Guangzhou. Guangzhou, where we spent the first week, is 2,000 years old. Guangzhou is also nicknamed the Flower City or the Five Goats City. According to our lecturer, Guandzhou is the gateway to understand China. Learning about the Chinese education reforms and our school visit. 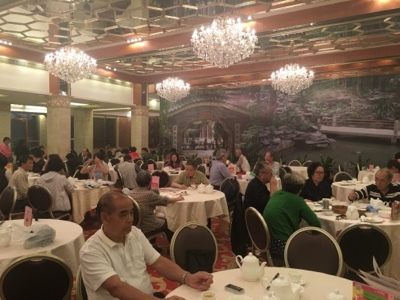 This post, the fourth in the series, Ni hao (Hello) China Travelogue, covers our Day 2 in China as the South African education delegation. We were given an overview of China's educational reforms and we visited a primary school. 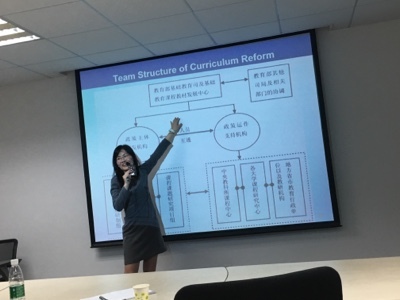 On a rainy, humid day we travelled from our hotel to SYSU for our second lecture entitled "The Policies and Experience of the New Curriculum Reform in China." Here is a snapshot of that informative, interesting lecture. Visit to Sun Yat-sen University and the Chinese Art and Culture at Caimo Tang. This is post number 3 in the Ni hao (Hello) China Travelogue. This post marks the beginning of our China tour. The first day started on a high note. Visit to Sun Yat-sen University (SYSU) in Guangzhou. Our first day in China started off with a welcoming ceremony at Sun Yat-sen University (SYSU) in Guandzhou. Guangzhou is in South China, in the Guandong Province. We learned about the history of SYSU. This university was founded in 1924 by Dr. Sun Yat-Sen, one of China's great revolutionary leaders. About 83,000 students attend SYSU, of which 3,200 are international students. SYSU is one of the top ten universities in China. It is a multi-disciplinary university with an inter-cultural centre for research and language courses, we were told. We met a Zimbabwean and a European student during a tour of the campus. There are many green spaces on the campus. We saw a group of people playing a game with a badminton shuttlecock in one of these green nooks. This is the second post in my Ni hao China travelogue blog series . 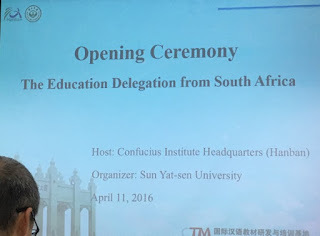 I was part of the South African education delegation that was invited to visit China for ten days. 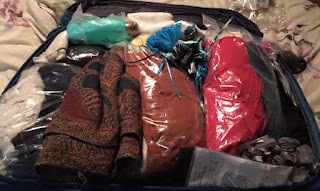 Even packing my travel bags was a mission for me, a novice international traveller. I fretted about how to pack because I needed at least four formal outfits for the official visits to San Yat-Sen University, two schools and Hanban Headquarters. Then we were going to tour a few historical and cultural sites as well. "Go minimalist," the blogger travel experts ranted. "Maximum two pairs of shoes, flip flops, three bottoms and about five tops to mix and match." I struggled. I don't know how these travellers combine business and leisure outfits into a shoestring travel wardrobe. When I sent my friend , Tertia, a picture of my travel case, she replied in a nano second. 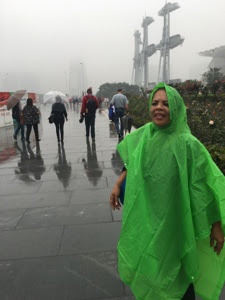 My travelogue, "Ni hao China", is a series of posts of all the amazing experiences I had when I participated in an educational tour of China from 09-20 April this year. I have never travelled overseas and we had planned to visit Thailand later this year as our first international destination. However, life happens. I was invited to participate in a Study/Cultural Tour of China that was organized by the Confucius Institute at the University of Cape Town. Needless to say, I jumped at the opportunity! In my travelogue, Ni haChina, I will capture all the amazing experiences from the clumsy travel packing, to the experiences in China and the rich conversations I had with my fellow travellers. This page will double as a central page that sets the scene for the travelogue. Musings about the BEFORE China preparations and the IN CHINA highlights. Conversations with the travelling principals.